"He can call me a flower if he wants to. I don't mind." The first five theatrical features from the Walt Disney Studios are all amazing artistic achievements, with a visual and emotional content that's been unmatched by just about anything since. There's an incredible attention to detail and laser-focused story-telling. The backgrounds alone are all amazing works of art, with gorgeous displays of light and shadow that make every moment on the screen a visual thrill. Perhaps the most finely-rendered of them all is the fifth and last of the great Disney classics, Bambi. The story, loosely based on the novel of the same name by Felix Salten, centers on the life of a young deer, Bambi (voiced, over various periods of his life by Bobby Stewart, Donnie Dunagan of Son of Frankenstein, Hardie Albright and John Sutherland). His close friends, the rabbit Thumper and skunk Flower, help Bambi learn to speak and to deal with the world around him. Bambi's mother (Paula Winslowe) cares for him through a difficult winter and warns him of the dangers of the open meadow. When she is shot and killed by a hunter, Bambi must learn to grow up in a hurry. He falls in love with Faline, and must fight for her against young buck Ronno. The climax comes as the hunters return, pursuing Faline with a dog pack, and accidentally setting the forest ablaze. Few movies, animated or not, pack the emotional punch of Bambi. Much of this impact comes from the fact that unlike most Disney heroes who take an active part in their own fates, Bambi, like most of us, has things happen to him and he must try to cope. He doesn't go off to have adventures but has adventures just in his pastoral life in the forest. The complex balance of beauty and danger in the woods gives a depth to the situations in which Bambi finds himself. Disney surprisingly refused to pull the punches also; there are plenty of moments that are terrifying to children, such as vivid fear in the thunderstorm, being cold and starving, and of course the seminal moment of loss of innocence, the death of Bambi's mother. Plenty of ink has been spilled over this moment; suffice it to say that few who can call themselves "human" can make it through this sequence without dropping a tear along with the young deer. One of the intriguing bits of characterization here is the use of children to voice the young animals. The performances are natural and work so very nicely in context that it's hard to imagine them being done otherwise, though today they all would be cast as adults for name value, a truly regrettable development. In particular, young Peter Behn's innocence and brashness as young Thumper is hard to forget. The animation of the animals combines a certain amount of anthropomorphism with naturalistic animal movement, to give a unique look at the world of nature. Bambi himself has a combination of grace and awkwardness that is both charming and feels very real. Disney's multiplane camera gets a real workout here, from the very first scene as the three-dimensional quality of the forest is made apparent. The visuals are particularly marvelous, building upon the experience of Fantasia to make a rather impressionistic forest. The expert use of light and shadow recalls a combination of Monet and Rembrandt. Particularly notable are the fire sequence and Bambi's fight with Ronno, which is only done by suggestion of highlights on a black screen. The watercolors by Tyrus Wong are splendid, with delicacy at times and the dark threats lying beneath the surface. The score by Frank Churchill and Edward Plumb is almost flawless from beginning to end, heightening the experience to the point that it's almost painfully good. Between this picture's inexorable pull on the eyes and the ears, the heart doesn't stand a chance. Image Transfer Review: The image of this restored version of Bambi is both its greatest strength and weakness. The dirt and crud of the decades have been cleaned up and the color brought back out so that one can hardly detect any age on the picture at all. It has a gorgeous freshness and immediacy that reminds one of the theatrical experience. On the other hand, some sequences appear to have had digital noise reduction applied a little too vigorously. Film grain is completely eliminated (compare the very different appearance of the original theatrical trailer on Disc 2), giving it a somewhat artificial appearance. Worse, the line work is affected in some segments, such as the early scenes of the young rabbits, and Bambi's reaction shot after first seeing Faline. The lines in those spots seem very soft and dupey, like watching the film through dirty glasses. The level of perfection that has been aspired to has frankly been overshot significantly, and it's the one serious disappointment in this disc. Most viewers probably won't notice, especially on smaller sets, but the restoration really doesn't stand up to a critical examination. Audio Transfer Review: The original mono track is included, and even though there are 5.1 remixes available on the disc, the mono sounds the fullest and feels the most natural. All are quite clean, but the mono has somewhat more high register and a lush feeling than the more elaborate tracks. The "enhanced home theater" tracks are designed mostly for folks who want to use all their speakers rather than hear the audio as it's supposed to be heard. But that's fine for those folks, as long as the original mono is preserved as it is here. Extras Review: There's a wealth of riches on these two discs; oddly enough the box text rather undersells just how much valuable material there is here. Most prominent is a a reenactment of excerpts from the story meetings, derived from the original typed transcripts. These are far more substantial than that description, however, but actually function as a running commentary, since the entire film runs onscreen together with these comments, with art, storyboards, script and pencil tests popping up onto the screen at appropriate moments. There's some picking and choosing here, but it's very coherent and gives one a feeling of watching over Disney's shoulders as the film comes together. Best of all, the fellow playing Disney really sounds quite a bit like him. But there's a whole second disc packed full of material. First are two deleted scenes. They're not actually animated, but are drawings for the animation set to a soundtrack (which sounds like a re-creation, but it's unclear whether that's the case). The first question that comes to the minds of most people is whether those include the death of Bambi's mother; the answer is no. The first clip is a little romantic moment between the young Bambi and Faline. The second is a very different version of Bambi's first snow, with him taking the leadership role that ended up with Thumper in the final film. Removing this version was obviously a good call, since this picture is really about Bambi's learning experiences and this wouldn't have played quite right. Five games and interactive activities are provided for younger kids. The "Disney Backstage" section contains the real meat of the second disc, with a 53-minute making-of documentary that includes interviews with the voice artists and many who actually worked on the film. It's a very well-done piece that adds a lot of background. A featurette on the restoration, hosted by Patrick Stewart, shows the differences (good and bad) that the revised version on this disc displays, though of course without pointing out that lines actually disappear before your eyes. 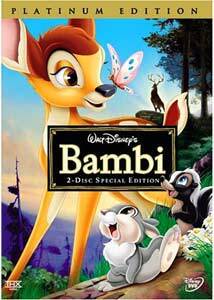 The upcoming direct-to-video sequel, set in the months after Bambi's mother dies, is previewed. A "time capsule" featurette looks at the world at war in 1942 when Bambi premiered, in London of all places. There are excerpts from a Tricks of the Trade episode of Disney's television program, with Walt himself discussing the multiplane camera. Its first use, in the short The Old Mill, is also included on this DVD. A featurette (8m:40s) gives a tour of the archives of the Disney studio, with original artwork and story sketches not used in the final version of the film, including a full development of the squirrel and chipmunk briefly glimpsed in the opening sequence. More art is on display in either a still frame or guided tour slide show format. Finally, there's the original 1942 trailer. It's a comprehensive and very delightful package. One of the greatest films ever made, with a full (some might say excessive) restoration and tons of extras. There's no excuse for omitting this DVD from your collection.